"We’re afraid that we will never escape our past. We’re afraid of what the future will bring. We’re afraid we won’t be loved, we won’t be liked. And we won’t succeed." There's a lot to get behind in Greta Gerwig's directorial debut, Lady Bird. From the hedonism that derives from the film's sunny Sacramento setting to feeling of uncomfortability that arises from seeing the monster that is adolescence take yet another victim, it's obvious that Gerwig has penned a deeply personal film; one that takes on multiple tones to balance out life's many challenges, while simultanously allowing us the space to try and comprehend them as well. Lady Bird is largely an introspection to love, life, family, and California living. 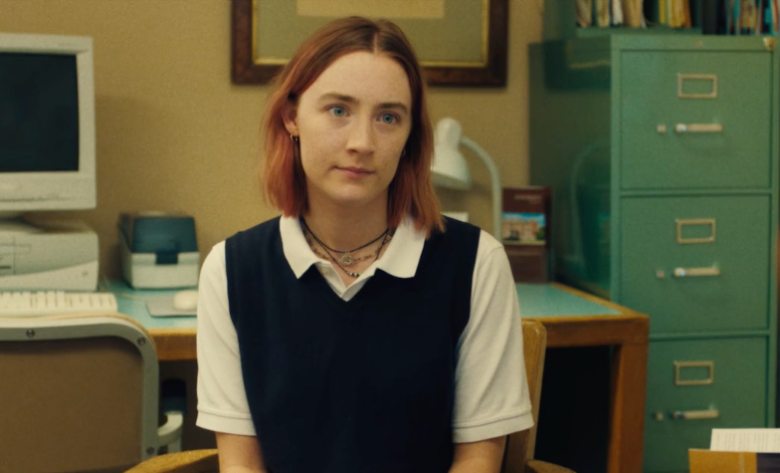 When we met our titular lead, Lady Bird (Saorise Ronan), she is in her final year of high school. She wants to leave Sacramento and move to the East Coast to New York or New Hampshire, "where writers live in the woods." Although she presents herself as strong-willed, tough and ultimately, certain about her environment, her future and the people she surrounds herself with, we know that this is all a facade. Though she does not realize it, in all of the encounters that she has, most importantly those involving her mother, she's unconsciously becoming a different person in every scene. The Lady Bird we meet at the beginning of the film is significantly different from the Lady Bird in the middle of the film and ultimately, the same goes same for the newest version of herself that appears at the end of the film. "My name is Lady Bird", she demands from her nagging mother, played by Laurie Metcalf, "Call me Lady Bird like you said you would." Though her mother ignores her pleas and she throws herself from the car, this act of defiance is completely different from the reaction that we see from the end of the film when she calls her mother to apologize from New York. The childish, impulisivity of throwing herself from a moving car also differs vastly from her actions in the middle of the film that involve her her passive-aggressively telling her mother that she would pay her back raising her and leave her alone. However, these are all prime examples of simply how teenagers behave and Lady Bird behaves as teenagers will. She's naive, thoughtless and, selfish, but who wasn't this way when they were her age? We roll our eyes and laugh as she relentlessly pursues Kyle, a laidback musician that refers to cell phones as tracking devices. We do the same as she contiguously tries to impress a popular girl in her grade by lying about where she lives. These events, though they may not have exactly happened to us, have a certain element of truth to them and in turn, they resonate with us. However, as life tends to do, everything shifts just as quickly as it came and the very thing that we were chuckling at, now has us holding back tears. There's sadness and disappointment that follow Lady Bird's eventual relationship with Kyle. We feel the same tinge of sadness as the popular girl ultimately ditches Lady Bird when she finds out about her deception. But, again, these instances move past us as quickly as they came and we're left to follow Lady Bird continue on her journey to get rid herself of her Sacramento roots. But while Lady Bird's identity is seemingly built around knowing who she is and what she wants, she still has a long way to go before she is fully able to understand the world around her. Her biggest struggle is not in her desire to leave Sacramento, but in how she fails to realize just how much the people around her have touched her life and vice versa. "Do you like me," she asks her mother during a thrift store shopping excursion. "Of course, I love you," her mother retorts frankly. "No, but do you like me?" Lady Bird continues. The scene ends without her mother answering her question and it's honestly the most dynamic moment of the film, which is a tragic contrast against the fact that they were bonding over a dress just moments earlier. Of course, Lady Bird's mother loves her, but she never admits so due to her pride. Their back-and-forth dynamic is a major catalyst for the changes that Lady Bird goes through as she unconsciously continues to try to please both her mother, who doesn't want her to go, and herself. In the end, she's given the space to step out of her mother's shadow to fully find herself, but the film suddenly ends before she can actually do so. It's a bittersweet moment, but it is also one that makes us question the progress she's supposedly made. Does Lady Bird really know who she is at the end of the film? Perhaps that just what she wants us to believe and perhaps it's what we want to believe about ourselves as well.